Nature Magnified: What is a Monkey Puzzle? What is a Monkey Puzzle? The first time I heard about the Monkey puzzle, I least expected it to be a butterfly! Yes the Monkey Puzzle (Rathinda amor) is a member of the lycaenidae or blue butterfly family. There is more than one theory why it is called as the monkey puzzle. 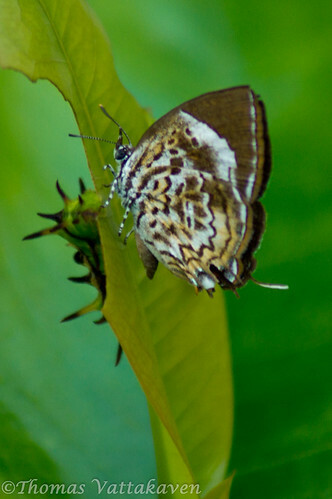 The first theory attributes it to its “puzzling” behaviour upon landing on a plant. As soon as it lands, it turns around and waggles its tail filaments and also does a side step. It is thought that this is done in order to puzzle predators, by confusing them about which side is its head. 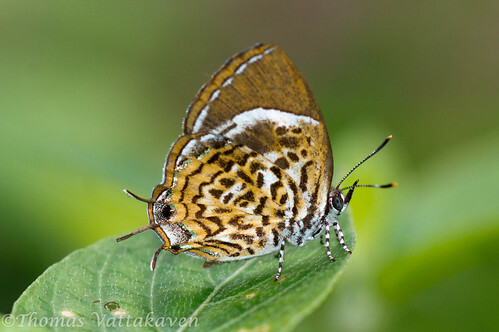 The other theory is that the name is derived from its larva. 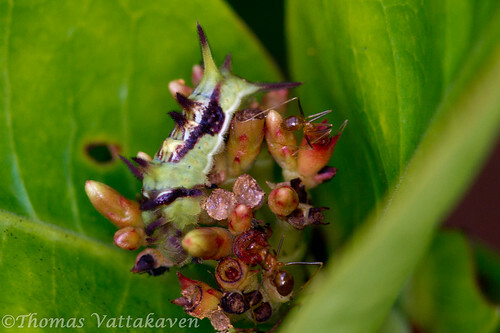 The caterpillar is unusually green for a species of Lycaenid. It is pale green with a long line of fleshy protuberances along its back. 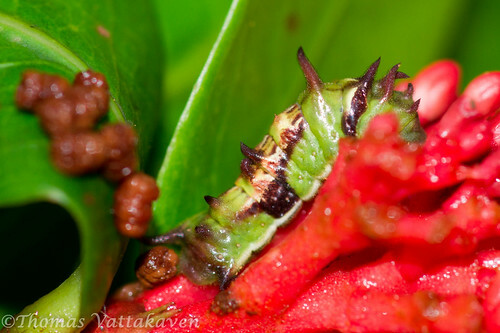 The larva is supposed to resemble a monkey and hence its name! 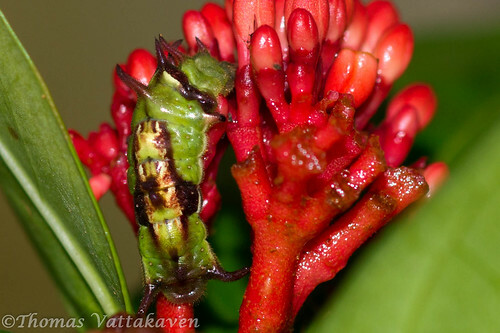 I photographed this larva on an Ixora plant. Surprisingly, I never saw it feed off the leaves. Instead, it seemed to be feeding off the flowers! 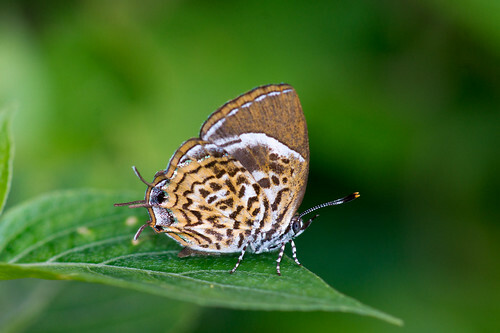 Most Lycaenid larvae are taken care of by ants. Most of these caterpillars have a relationship with ants in that they give off a sweet fluid to the ants and the ants in turn protect them from their natural enemies. 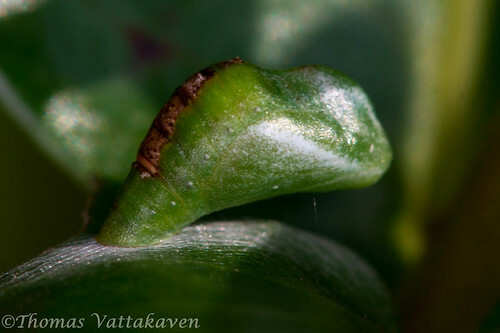 However, in this case I didn't observe any such interaction although ants were always present around the feeding larva. 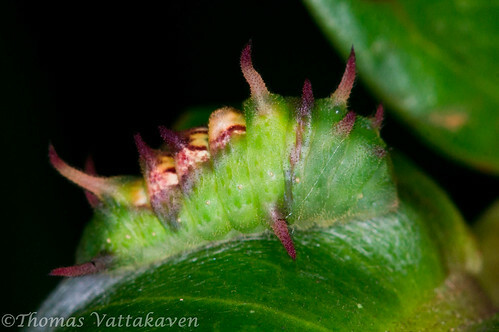 The above image shows a Monkey Puzzle larva in the process of pupation. Shown below is the fresh pupa. 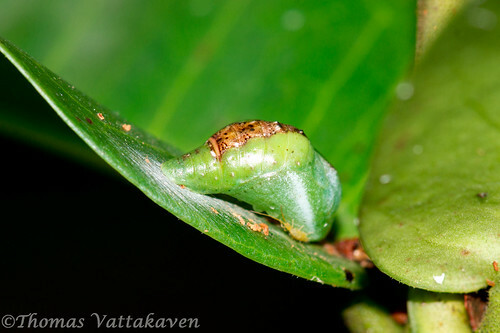 The pupa is green with brown markings and is attached to the leaf on its upper surface by means of a stalk. I have also observed pupation on the stem of the same plant. 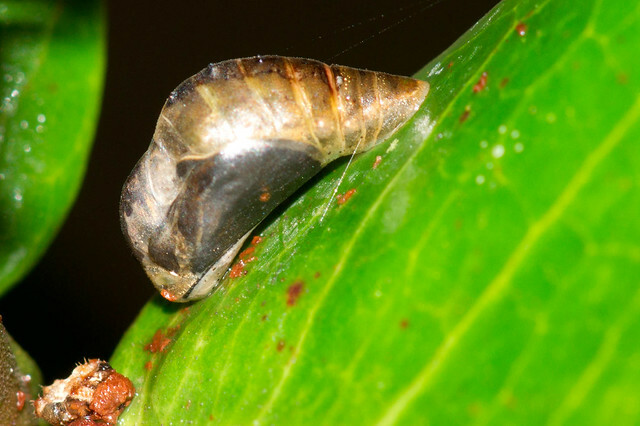 As the pupa matures, it grows more brown, and finally turns transparent with black interiors just before it hatches into the adult. 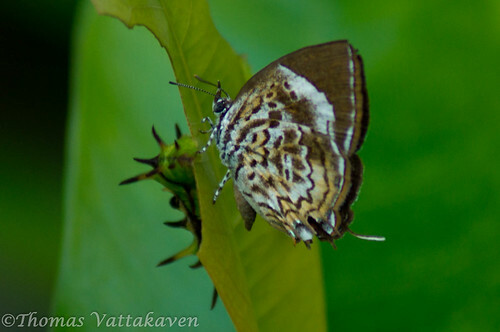 This butterfly is not rare in India, but I`ve never seen one until it started feeding and pupating on the Ixora plant in my back garden. Whether it is for its odd behaviour, odd larva, its odd name or its attractive colouration and marking, the Monkey puzzle is one intriguing butterfly.